Agent productivity – Enhances standard Amazon Connect reports with statistics based on agent sign-in/sign-out information. You can designate whether custom agent status labels defined in Amazon Connect should be treated as available, productive, signed in, or signed out. For example, a custom agent status called “Break,” which represents the agent taking time off from work, would typically be treated as signed out, whereas a custom agent status called “Project,” which represents some sort of project work, would typically be treated as signed in. Aspect Workforce Management (WFM) uses this information to produce statistics on average positions staffed (APS) by agent group, available time by agent, unavailable time by agent, and sign-in/sign-out pairs by agent. Real-time adherence – Provides Amazon Connect agent state change information to the Aspect Real-Time Adherence (RTA) product, which enables you to monitor the activities of your Amazon Connect agents and see how well these activities adhere to the agents’ schedules. You can choose either or both options when you deploy the Quick Start. The integrations include AWS services such as Amazon Simple Storage Service (Amazon S3), Amazon Kinesis, Amazon Kinesis Data Analytics, Amazon Kinesis Data Firehose, AWS Lambda, Amazon DynamoDB, Amazon Simple Queue Service (Amazon SQS), Amazon CloudWatch Events, and AWS Identity and Access Management (IAM). Both integration options use an Amazon Connect agent event stream. An Amazon Connect instance supports a single agent event stream. If you have already enabled agent event streams and selected a Kinesis stream for that purpose, choose one of the deployment options that uses an existing Kinesis data stream. 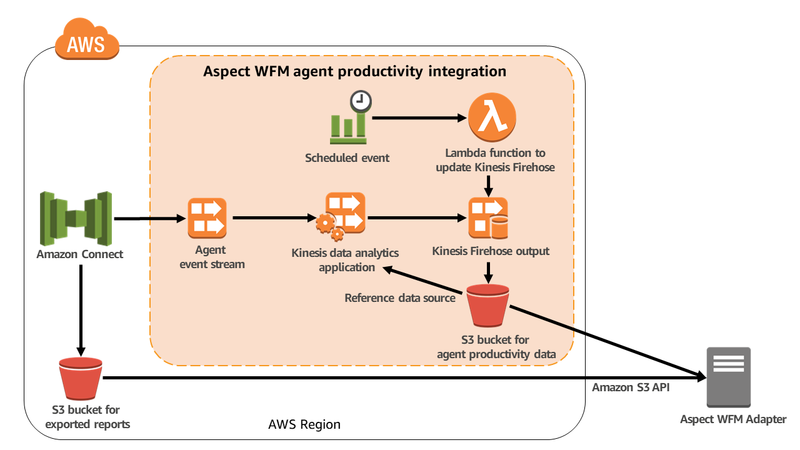 If you haven't enabled agent event streams for your Amazon Connect instance, choose a deployment option that creates a new Kinesis data stream. Note This stream will initially be sized with a single shard. You may need to adjust the shard count of the stream, depending on the rate of agent events and the number of consumers (Agent Productivity, Real-Time Adherence, and any other custom applications that read agent events). For more information, see the Amazon Kinesis documentation. An S3 bucket that holds the agent productivity outputs. A Kinesis data analytics application that reads agent events from your Amazon Connect instance. The application categorizes those agent events as spans of signed-in or signed-out time. A Kinesis Data Firehose data delivery stream that writes the output of the Kinesis data analytics application to the S3 bucket. A Lambda function that also writes to the Kinesis Data Firehose data delivery stream. This function ensures that output objects are written to the S3 bucket during periods of time when no agents are signed in. A CloudWatch Events rule that calls the Lambda function on a schedule, every five minutes. The S3 bucket for exported reports, associated with your Amazon Connect instance. You will need to schedule the export of several Amazon Connect reports. For details, see the Aspect WFM Adapter documentation, which is available on the Aspect Customer Portal. The S3 bucket created by this integration. The Aspect WFM Adapter converts the information in these two buckets to the format required by Aspect WFM and produces per-interval and daily historical reports to support the forecasting, scheduling, and tracking features of Aspect WFM. A DynamoDB table that holds the latest state change for each agent signed into your Amazon Connect instance. An SQS queue that is used to relay Amazon Connect agent state changes to Aspect Real-Time Adherence (RTA). 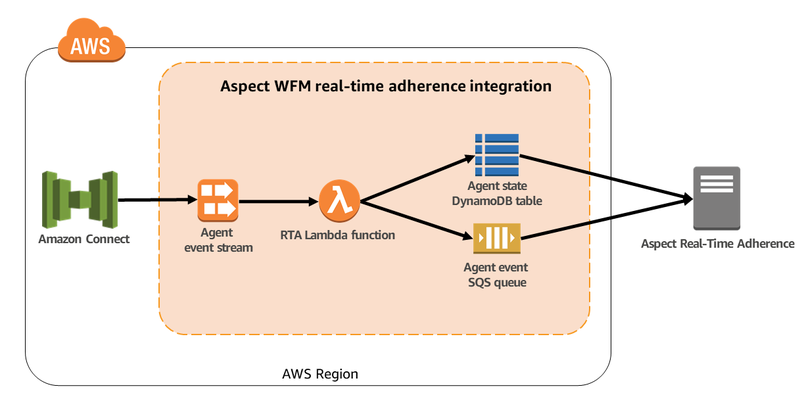 A Lambda function that is called whenever your Amazon Connect instance writes events to its agent event data stream. The Lambda function is responsible for updating the DynamoDB table and SQS queue created by the integration. Read-only access to the DynamoDB table. Read/write access to the SQS queue. Access to update the configuration of the Lambda function. Aspect RTA first reads the DynamoDB table to determine the current states of any agents signed into your Amazon Connect instance. Next, Aspect RTA updates the configuration of the Lambda function to instruct the Lambda function to write agent events received by the SQS queue. Finally, Aspect RTA polls the SQS queue for agent events and sends the agent state changes it sees to any connected RTA users. This Quick Start was developed by Aspect Software in collaboration with AWS. Aspect Software is an APN Partner. Follow the steps for creating a new Kinesis data stream or using an existing stream for your integration. Step 1 Sign up for an AWS account, if you don't already have one. Getting an account will automatically sign you up for Amazon Connect and all other AWS services. Step 2 Create a new Amazon Connect instance for the integration, or use an existing instance. You must deploy this integration in the same AWS Region as your Amazon Connect instance. Complete the parameter fields. Deployment takes just a few minutes. Step 4 Enable data streaming and agent event streams. Follow the steps in the Amazon Connect documentation to set up data streaming. Enable agent event streams for the Kinesis data stream created by this integration. Step 5 If you're using the agent productivity feature, edit the sample reference table (ASPECT_AGENT_STATUS_INFO.csv) that we have provided to describe the meanings of agent status labels defined in your Amazon Connect instance. Add this object to the S3 bucket created by this integration. For information about the format of this file, see step 4 in the integration guide on the Aspect website. Step 6 If you're using the agent productivity feature, start the Kinesis data analytics application by following the steps in the Amazon Kinesis Data Analytics documentation. Test the integration by using the real-time analytics feature of Kinesis Data Analytics. Step 3 Identify the Kinesis data stream that's currently configured to receive agent events from your Amazon Connect instance. To do this, edit your Amazon Connect instance in the Amazon Connect console and check under Data streaming. Open the Kinesis console and view the Kinesis stream you identified. Note the Amazon Resource Name (ARN) of the Kinesis data stream. You will need to supply this ARN in the next step. You are responsible for the cost of the AWS services and partner solutions used while running this Amazon Connect integration.